I searched far and wide for a henley like this. 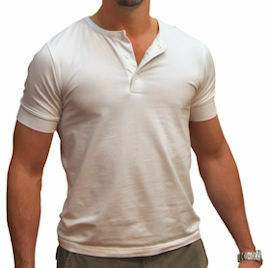 It has a true classic cut and fits as though henleys were originally intended, as an undergarment. It's form fitting, even after I sized up one size, but it looks very flattering if you have the physique for it. The fabric is amazingly soft and stretchy so it doesn't feel restricting; I almost couldn't believe it was 100% cotton. When I purchased this shirt I also grabbed one of the Grady Henleys, however I prefer the Drive Henley in overall fit and style. I really like the larger sleeve hems of the Drive, while the Grady has a much larger swoop neck which isn't quite my thing. However I love the "wheat" colorway of the Grady. If possible I would love to be able to get my hands on a version of the drive Henley in "wheat" in the future. I highly recommend these shirts.